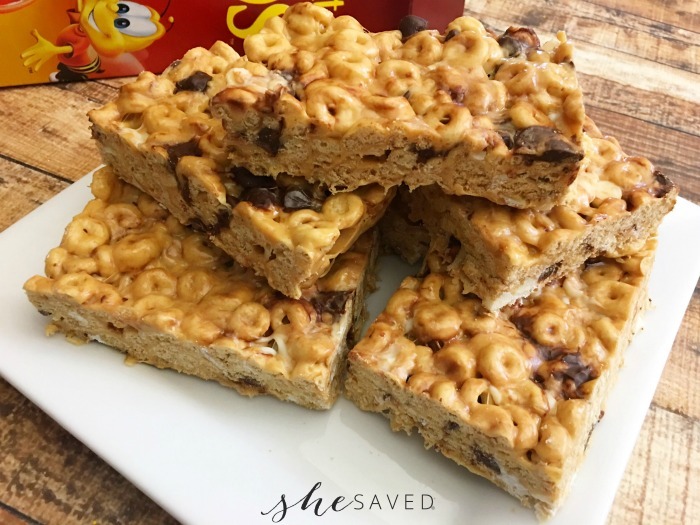 Looking for a fun twist on the old cereal bar recipe? 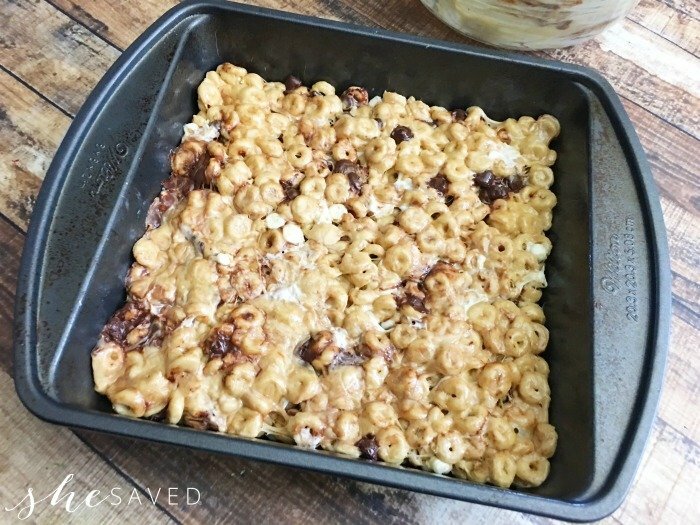 This Chocolate Chip Cheerio Bars recipe contains so much chocolate and peanut butter goodness you won’t be able to put them down! 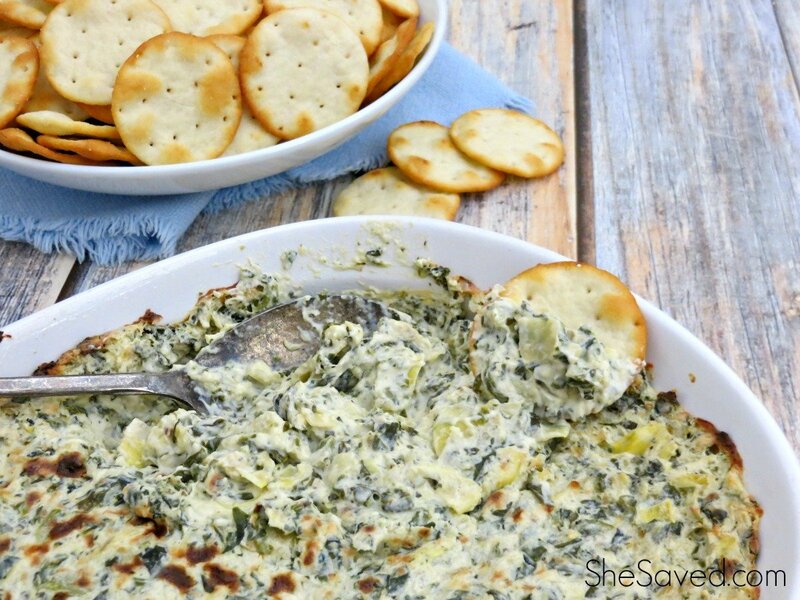 To be honest, I have been wanting to share this recipe forever as it’s one of my personal favorites. However, as you can see, it’s not the easiest to photograph. But trust me on this, it’s super delicious and really easy to binge on. 1. Grease a 8 x 8 baking pan with a nonstick cooking spray. 2. 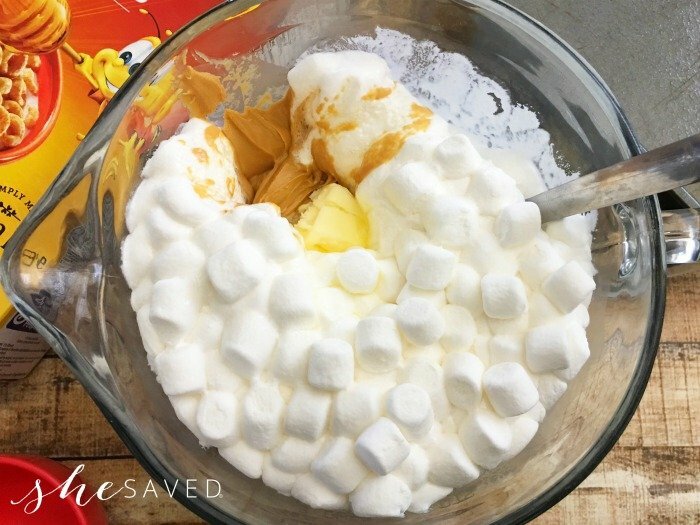 In a large mixing bowl, heat your marshmallows, peanut butter, and butter for 2 minutes or until the marshmallows get puffy. 3. Stir your marshmallow mixture well and mix in 6 cups of your cereal. 4. Fold in your white and semi sweet chocolate chips. 5. Scoop your cereal mixture into your greased baking dish and press your cereal mixture into your pan evenly (I like to grease a plastic bag or a potato masher and press it into the pan). 6. 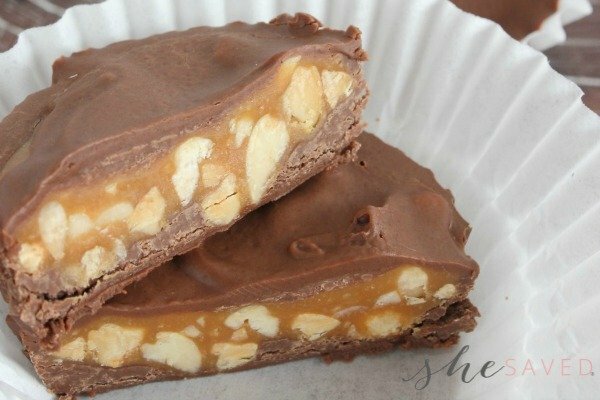 To make cutting easier, freeze for 15 minutes and slice into bars. 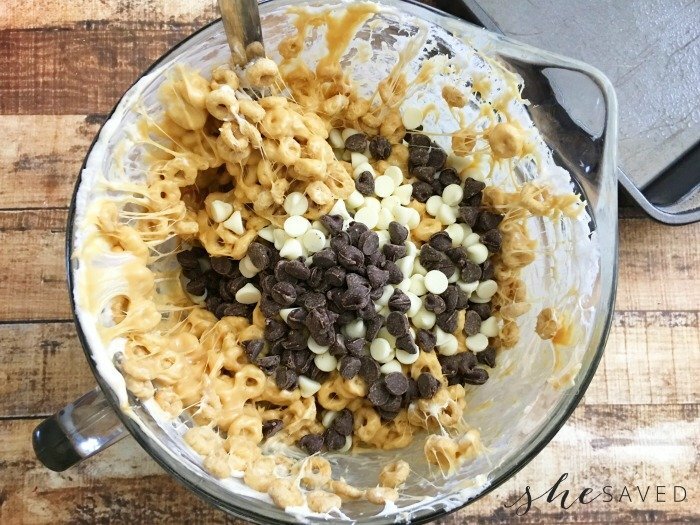 Another thing that I love about this easy dessert recipe is that it’s a no bake recipe, which makes it a great starter recipe for teens and tweens. In fact, this is a recipe that I used to make much too often in college. 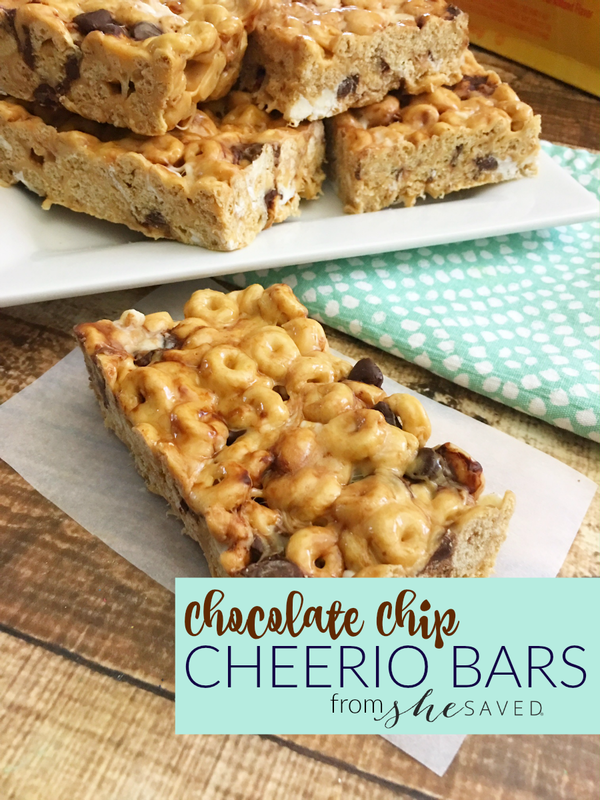 Enjoy this Chocolate Chip Cheerio Bars recipe with the whole family! These look amazing! 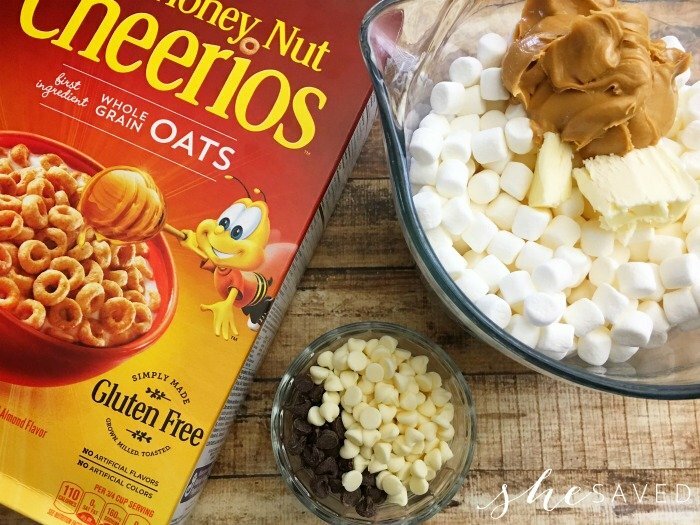 Honey Nut Cheerios are a favorite around our house, I will have to try making these. Thanks for linking up at Merry Monday! Delicious idea! Thanks for linkin' up with What's Cookin' Wednesday!